The letter P is for a lot of animals, I have found. Pig, pelican, penguin, panther, panda, piranha and pug being just some of them. However, you'd need a bigger idiot than even I am, when making a colouring book, to NOT do a parrot. So that is what I did. 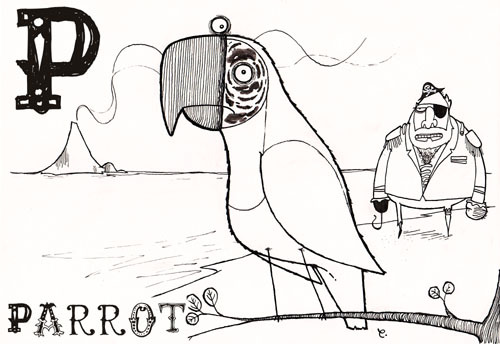 A parrot perched on a perch with a pirate, indeed. If you want to make this parrot all the colours of the parrot rainbow (which is basically green, let's be honest), you can download an A4-size version to print out right HERE.